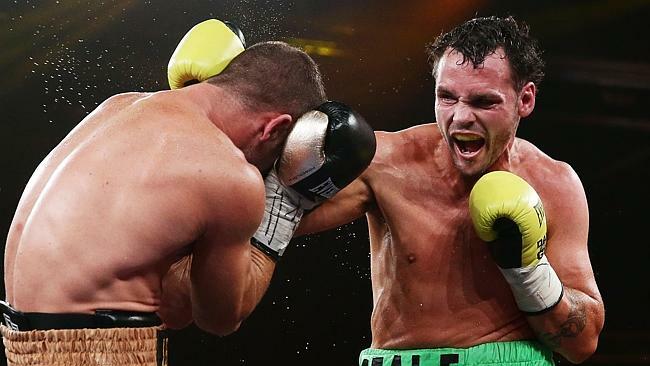 DANIEL Geale put 13 years of friendship aside to batter Brisbane’s Jarrod Fletcher in a punishing 12-round points decision at Sydney’s Hordern Pavilion on Wednesday night to prove he is still one of the world’s top middleweights. On a fight card that also saw Blues Origin skipper Paul Gallen force his former Cronulla team-mate Anthony Watts to surrender in just 88 seconds, Geale, the former world champ, overpowered Fletcher to hand him his third defeat in 21 starts. In a fight between two Olympians who fought on the same team at the 2002 Commonwealth Games, Geale, 33, showed the benefit of his greater experience as a professional, proving too strong and persistent for Fletcher, 31. Daniel Geale fights Jarrod Fletcher. The Queenslander made a positive start as a patient Geale allowed his old friend to dominate the early going. 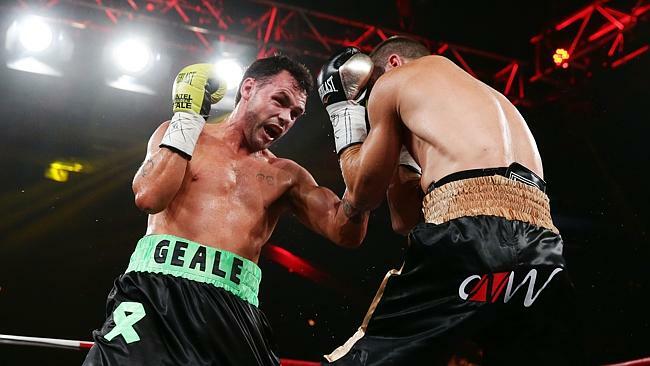 But once Geale found his range in the fourth round the fight became one-sided. Fletcher was down in the fifth after eating a massive right and was on wobbly legs in the closing rounds, though he showed enormous heart to rock Geale in the final moments of the fight. 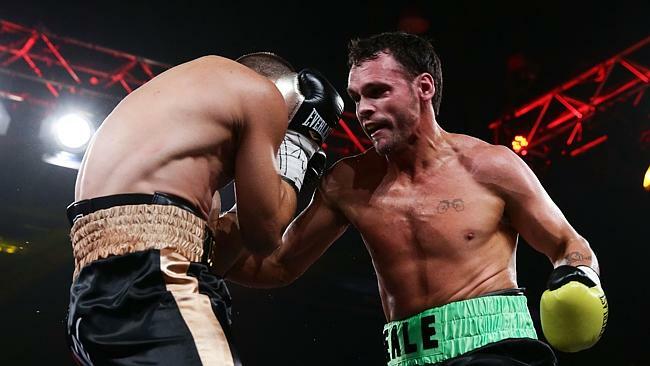 Geale’s corner implored their fighter to show some ``mongrel’’ and stop the Queenslander from the ninth round but Geale later denied that he had taken his foot off the gas because of his long-standing friendship with the Nudgee father of two. Daniel Geale punches Jarrod Fletcher. 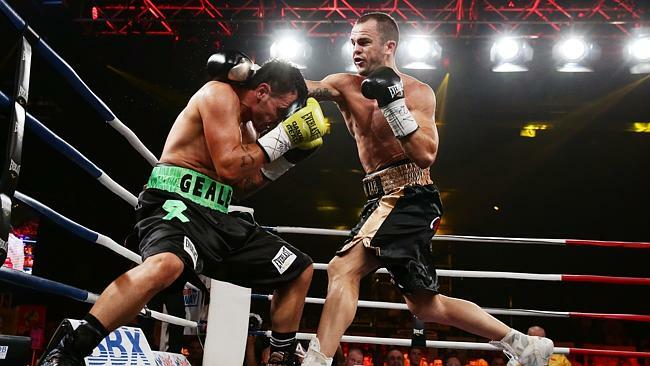 “I was trying to stop him,’’ Geale said. “I’m disappointed that I couldn’t. I felt he was ready to go but Jarrod is a smart and skilful boxer, a good mover. Even when he was hurt he knew how to get out of the way. “It wasn’t my most polished performance but give Jarrod credit – he’s a skilled athlete. All three judges scored 119-108 or 11 rounds to one. Daniel Geale fights Jarrod Fletcher at Hordern Pavilion. Both men were coming off knockout defeats, Geale against Kazakhstan’s Gennady Golovkin and Fletcher against American Daniel Jacobs. But it was Geale who emerged from the cauldron of defeat stronger and more focused than his one-time room-mate at the Australian Institute of Sport. Geale now has 31 wins from 34 fights. The long-awaited Paul Gallen-Anthony Watts heavyweight slugfest lasted just 88 seconds with Watts telling referee Mick Heafey he had damaged the rotator cuff on his left shoulder and couldn’t continue. Jarrod Fletcher punches Daniel Geale. The former Cronulla Sharks team-mates threw massive punches at each other while it lasted. Earlier in a close hard-fought 10-rounder, Melbourne’s Australian super-middleweight champion Jake Carr retained his title on points against Sydney’s Renold Quinlan, who had Anthony and Tony Mundine in his corner. Carr’s relentless pressure took the points 96-95 (twice) and 96-94. Townsville’s rugged Mark Flanagan outpointed Sydney’s Shane Quinn to retain the Australian cruiserweight title 96-94, 97-92 and 95-93, decking him in rounds three and five and surviving some furious counter-attacks.